So my inspiration for this comes from our current living space. When we first looked at our current home to rent over a year ago I a noticed the deep sunset red wall. (there is a tinge of pinkish orange is think). Anyway, I was not excited about the color so we asked if we could paint the red wall...we could as long as we did a good job. We have a seafoam green couch and chaise set so I chose a light gray shade. Only to return to our new home just before moving in with a gallon of paint and seeing it was not one wall like for some reason I had in my head, but all four walls in the large open living space - complete with archway. Whoops - I still have that gallon of paint! So we moved our stuff in and it didn't clash after all. I used a brown throw and some khaki colored pillows and it all seems to tie in nicely with our dark wood accents. 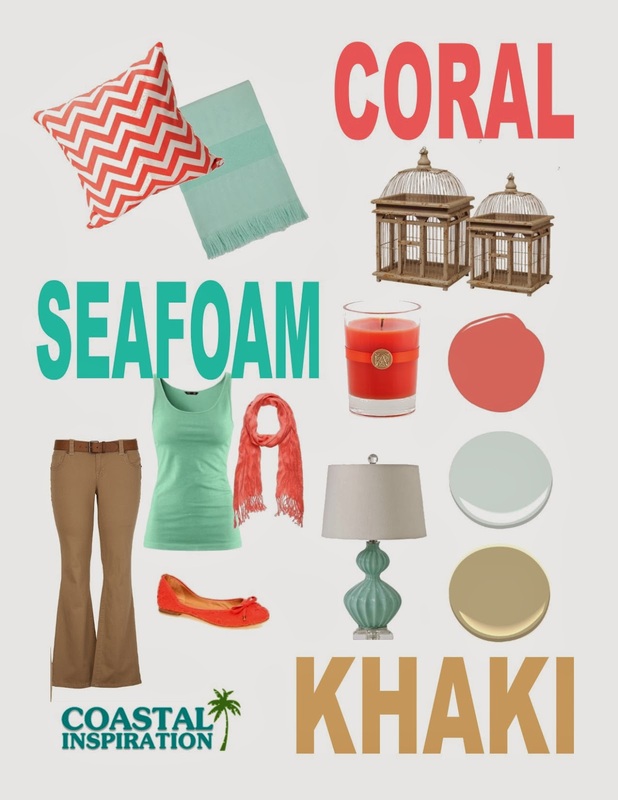 Wa-la - my version of Coral, Seafoam and Khaki...with out any painting. (Yay!) So the moral of this story is color inspiration is not exact and can be pulled from the same color family and still work. And moving things from another room or location from the house can pull a look together without any added expense. You don't have to break the bank to create a new look. And as time goes on I can pick up things I really like here and there. It's a pro-cess.